In this story, chapter one in particular, amazes me on how laws and the life of women can change in an instant; from being free to do what one wants to having to say “we weren’t allowed out, except for our walks, twice daily, two by two” . How freedom can be snatched away by other human beings who, like all humans, should know better. To constrained a group of people and lock them up in a gymnasium against their will and the only thing that they can do in defiance is to “learned to lip-read….watching each other’s mouth. In this way we exchanged names, from bed to bed”. In Chapter two, I see that the color red is significant. They way the narrator talks about it is intriguing. Because, when she is putting on the red gloves, she “pull them onto my hands, finger by finger” . It is like she is slowly transforming from her true inner self to the color red itself. Red is becoming her fingers. The shoes are red, these are her new toes and so is her dress, which becomes her new body. It is as if red is her only identity now since in chapter one her name was nothing more than a mere whisper among lip-readers. The color red is louder than a whisper and it doesn’t make a sound. Red makes her seen. The color red defines her. Red is the mark of her status in this new world. Once she puts on her uniform, she is less than the woman she was outside her uniform. In this uniform she is a machine. She cannot think. She is even more restricted now and have to follow a set of rules. She is not even a person. Her white head veil blocks her sight and keeps her from being seen. As if the only important thing to see is the color red and her body. Her body, because she is a handmaid and her main job is to bear children. Her red outfit screams that loud and clear. Her red outfit is “the color of blood” . But, blood is the only thing that the handmaids don’t want to see. 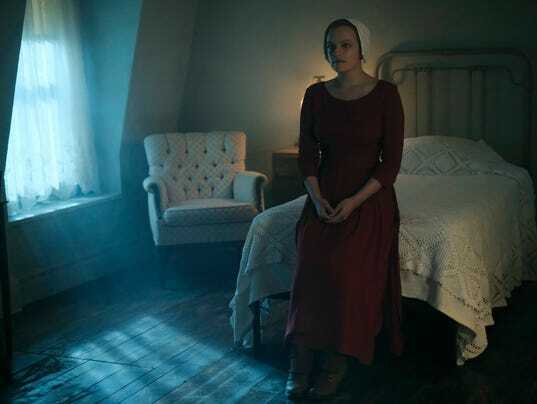 The leaders of that new world wants the handmaids in red, but if they have their periods and is not pregnant then they are in trouble. The narrator is no longer an individual. She is no longer her own woman. She is now red. Red is now she. Red is the color of her umbrella. Red, is also, in her new name Offred. Red is so much of who she is in the beginning of this book. I wonder, will she make the color red her friend and use this color as a way to survive this terrible time in her life. Also, if she lives to see the end of this way of life, would she frame her red outfit and use it as a reminder to herself of how she once lived as a color and how precious life and freedom are. Will red become her favorite color? This entry was posted in Parts I-II, People's Choice Posts, The Handmaid's Tale on November 2, 2017 by Kina. Survival Isn’t All One Needs: Memories Are Necessary. The word Survival can mean many things to many people. In Station Eleven, by Emily St. John Mandel, surviving was not equal to living. That surviving was some how less than living. With this Idea in mind one would have to ask; What does it means to survive Isn’t living, alone, proves one’s survival or is there is more to it? In Station Eleven, we are lead to believe that there is more to living than survival. That just merely surviving isn’t living. Station Eleven’s story is all about doing more than just surviving. One of characters, Kirsten, have the words “Survival is insufficient…tattooed on her left forearm” (120). The traveling Symphony have words on their lead van that say “Because survival is insufficient” (58).The meaning of these words are part of the theme and tone that is set through out the book.Which helps us, the readers, to understand why some of the characters held on to some of the things that they use to help them live in the new world that surrounds them. For, example, the Traveling Symphony and Shakespeare’s play. The Traveling Symphony were a group of actors and musicians who migrates from town to town to put on shows by acting out Shakespeare’s plays. They do this to give the the town’s people something good from the past. Because of the Traveling Symphony moving from town to town, it seems,that the ability to be able to entertain others and to travel is more important than to just live. By, holding on to the theater arts, it has giving Kirsten and the rest of the traveling group a reason to live. Acting gives them something else to think about instead of being constantly focus on all that was taken away from them 20 years ago. I am just starting out with this essay. I am currently making an outline to help me along with this essay. I am thinking and re-thinking about the title and thesis for this essay, wondering if I should change anything. It has been awhile since my last English class to this one, so I am a little rusty on writing a well written essay. I am nervous and willing to see this through. This entry was posted in Essay 1, Pre-Draft, Station Eleven on October 29, 2017 by Kina. Well we are at the end of Station Eleven and I was thinking, since our professor is really stressing for us to try not sum up the chapters, that maybe I can talk about how some of the characters and events that happens in the main story reminds me of the events and people in the imaginary comic book, that was written by Miranda, who is a character inside the story. The few people that I am going to talk about are Clark, Robert, Arthur, Miranda, Tyler,who is also the prophet, and Georgia Flu. I guess that it is safe to say this is only my opinion and by no means am I saying this is the way it is. This is just how the main story reminds me of the comic. In my opinion, Robert is like Captain Lonagan, in which both were hardly mention throughout the story and both of them were kind of killed off and seen as coming back to talk to their friend as apparitions. I see him as Luli. They are both mentioned throughout the story and they have been part of some of the character’s life in one way or another. Just like Luli, Arthur is remember by the people who knew him or read about him in magazines. Luli is remember by being Dr. Eleven’s dog in the comic and Its funny because Kirsten has articles about Arthur and have the Dr. Eleven comic books that mentions Luli. Another thing that they have in common is Clark. Clark saw Miranda’s dog who name is Luli at the dinner party that she and Arthur had. (91) Plus, both Arthur and Luli had belonged to Miranda at some time. They both die before Miranda. Is Like a God, some what, because she created a comic book called Station Eleven that foretold of a destruction of a imaginary Earth and how people of that Earth was effected by an unknown Alien civilization that had captured it. Then something parallel to that story happen to the lives of the people in the main story. Both the comic and the main story speak about what happen in the future after the Earth’s destruction. In the comic book it says “This is all a thousand years in the future.” (83) and then in the main story “Twenty Years After” (35). Tyler who is also known as the Prophet is a prophet who carries around with him (as we later find out) a page from “Dr. Eleven, Vol. I, No. I: Station Eleven, the first page of Station Eleven” by Miranda. He even quoted some of the words from the comic book. He believes in some of its message. This is also why I considered Miranda as godlike because later on after she died she had two people to carry her comics around and one person even lived by following some of its ideas. Is like the Aliens that have taken over Dr. Eleven’s real home. Just like the aliens in Dr. Eleven, the Georgia flu is like “A hostile civilization from a nearby galaxy” (83). The Georgia flu is just a mutated version of the Swine flu which is the “nearby galaxy”. It is funny that on page (235) we see “Tyler…Cross-legged on the floor nearby, killing space aliens on a Nintendo Console” That takes me back to Hua, Jeevan’s friend working in the hospital trying to fight this unknown string of the flu. and then on page (236) “Tyler groaned softly; he’d suffer a setback in the alien wars.” Which is what happen to the characters of the main story, they were dying because of the Georgia Flu. This to me is another small detail that made Tyler the prophet. Little did he know that his game was showing what was happening to the world around him. I know that there are some more similarities that I missed out on between Station Eleven the main story and the imaginary Miranda story, but again this is all my opinion if anyone else want to add on feel free. This entry was posted in Parts 7-9, Station Eleven on October 22, 2017 by Kina. Writing, is for me, a way to express myself. I can put down on paper what I would love to say out loud, but it may come off as an insult or something unbecoming. I use writing as a way to escape this world and travel to unreal places. Places that I can go to without judgement and rejection. Where I can be a hero or make up one that looks like me and can be accepted by the character’s heroic acts. With writing, I can jot down all of my thoughts in tangled sentences without worry about punctuation, and grammatical errors. Writing is a way for me to express, and open myself in a vulnerable way to myself. I think writing helps you to know yourself better.With writing I can see my thoughts on paper. I can tell what kind of story teller I’am. If I’am writing for my own eyes, I can tap deep within myself and give my dark inner thoughts words that it can use for me to see just how dark I can be and to make peace with myself. Writing gives me that best friend that is way better than my best friend. 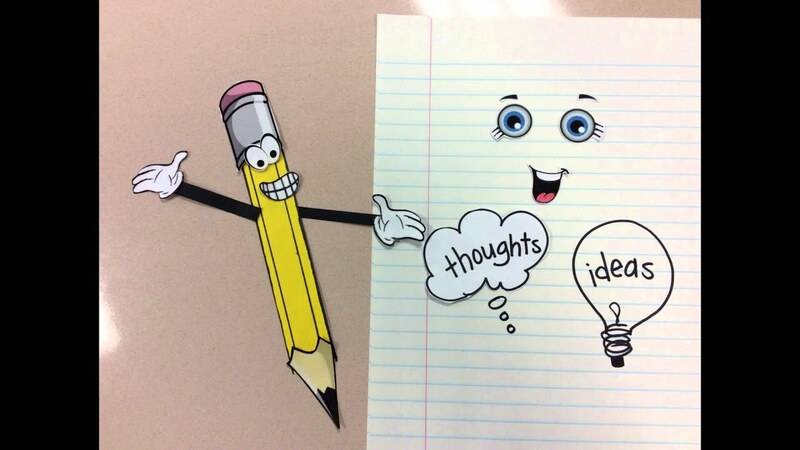 If I have something to say I can always count on a pen or pencil and paper to jot down my immediate thoughts. Writing never has to be “called over” because writing is just my thoughts that I can put down on paper. Writing also helps me sort through ideas that I may have for a project. Sometimes writing helps me put my priorities in order. I really love to write, but mostly I love writing on my own terms more. I hate having to be force to write, especially if it is on a project for a class about a topic that is boring. I believe that writing opens the door to imagination. For me, I like to think up different worlds or monsters in my head and write them down on paper. I love that freedom that writing gives to me. Writing will always be my mistress. I will always have love for it. Writing will always be a part of my life that I will hold dear. So, to sum up why I write, I write because it is the only thing that is purely me. I love doing it and it keeps me in check with myself. It lets me look back on myself. Like when I was younger I kept a diary, now, I can look back and see my thoughts on things when I was younger and see how I think differently about them now. Writing is my friend, my enemy, my lover, and my life. Because of all these things is the reason why I write. This entry was posted in #WhyIWrite, Extra Credit on October 22, 2017 by Kina. We are reading chapters 4,5,6, but page (163) had struck a cord with me. What had caught my attention was when Clark was interviewing Dahlia about her boss Dan and while describing how she believes that her boss doesn’t like his job, she said “but I don’t think he even realizes it. You probably encounter people like him all the time. High-functioning sleepwalkers, essentially.” This made me think about the characters in the book a little bit more. Characters like Clark, I don’t think that he had ever even realized himself, how much he hates his job. At least not until he talked with Dahlia and she mention “sleepwalkers” and at the end of his interview with Dahlia he was “thinking of what Dahlia had said about sleepwalking,”… “and a strange thought came to him: had Arthur seen that Clark was sleep walking?” (164). I believe that Clark needed that eye opener to his own happiness like when he asked himself “when had he last found real joy in his work” (164). I wanted to see if there any other characters in the book that may not like his or her job. Then chapter 5 had helped me with that when it start off with Jeevan Chaudhary. While reading this I got the feeling that Jeevan was just sleepwalking in all of his previous jobs. I don’t think that he was fully unaware of how he felt about his job, but he was just going through the motions just to make a buck. On page (167) the narrator said “Jeevan had been working as a paparazzo for some years and had made a passable living at it, but he was sick to death of stalking celebrities from behind sidewalk planters and lying in wait in parked cars, she he was trying to become an entertainment journalist, which he felt was sleazy.” That’s why in the beginning Part 1 of the book when Jeevan jumped on stage to save Arthur it was the thing that “jolts” him awake from the “drudgery” of work. He found something, on the day of Arthur’s death, to give him joy in the work he does. I believe that “sleepwalking” happens even in our society. I feel that I do it too. I love working in the library, but I love my second job a lot less. I feel like I just go through the motion at my second job, almost robotic like. However, I do look for things that can give me little escapes from living such a mundane life. Just like I think Arthur does when he feels uncomfortable about something, He acts. Page (211) gives an example of what I mean when Arthur was telling Miranda that his friend Victoria “had published the letters he’d sent her.” (210). He was drinking tea and by reading this I can tell it was uncomfortable having to tell Miranda that she might be in the book. So, when he said “I treated Victoria like a diary.” He “lifted his mug, blew on the surface of his tea, and returned the mug very deliberately to the table. There was a studied quality to the movement, and Miranda had an odd impression that he was performing a scene.” As we know that this is not the first time people accused Arthur of performing. On page (112) Arthur’s childhood friend Clark had thought that he was putting on a performance in the restaurant where they meet at to eat. I believe that it is some kind of escape mechanism from awkward situations. It is just like how August and Kirsten was talking about “A parallel universe” when they were looking through the magazines on page (201) when August say “It would’ve been you in those tabloid pictures”….”he said, picking up the parallel-universes theme.” i believe this was their way of giving themselves a break from the reality that they have to face each day. This was their escape to other universes. Their imaginary escape. I feel that in order to find out what really makes us happy we have to ask ourselves are we happy. We have to look at our own lives and see if we are just “sleepwalking” our way through it and if so, is that really living? This entry was posted in Parts 4-6, Station Eleven on October 16, 2017 by Kina. When would you say that life was valued more: before the Georgia Flu or After it? This entry was posted in Class Discussion, Parts 2-3, Station Eleven on October 13, 2017 by Kina.